One of the many obstacles facing the information technology growth in the Philippines is the high cost of ADSL or any other form of internet connectivity. It is starting to improve but not to the point where the averate "Juan" can afford to connect his home to the world. Make it worse by buying and paying for this much bandwidth without CIR, and actually getting only half that bandwidth, at best. It is not surprising then that there are people who squeeze the last bit of bandwidth they can. And this could come in the form of ad blocking. Believe it or not, 30%-50% of your bandwidth consumption is attributed to ads without you knowing it. For this article let us stop ads for the popular messenging platform, the Yahoo! Messenger (or YM). Follow along as we discuss how to stop ads from stealing precious bandwidth and still enjoy the functionality of YM. The trick to blocking ads is by IP redirection or loopback restriction. The usual location of the file containing the address of the ad server is in C:\Program Files\Yahoo!\Messenger\Cache and the file is urls.xml. 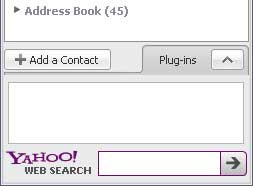 From that you can deduce that ads come from the ad server insider.msg.yahoo.com. You can now block that address via loopback restriction. Restart YM and upon restart, you will see something similar to the window below. This is a screenshot from YM version 9.0.0.2128. Seeing the above means your YM is now ad-free. Enjoy.